A custom lunch bag is the perfect way to dress up lunch time! Personalize this item with your pet's name or photo. Lunch tote face can be customized with any picture, art, graphics or text, printed in durable and vivid full color! 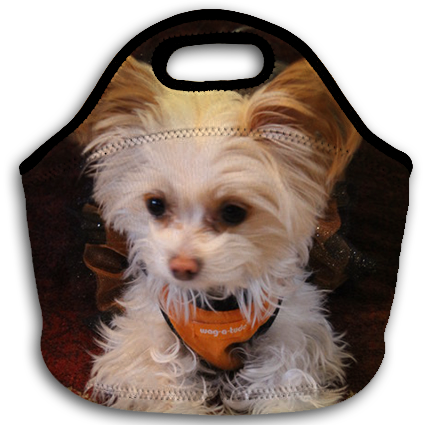 Fully customize with vivid detail printings of pictures, art, or any designs on the face of the tote! Made of neoprene and featuring an easy carry soft handle and zipper closure, this customizable lunch tote measures 12.5 x 12.5 inches and has a 5 inches wide gusseted bottom.